Hellblade: Senua’s Sacrifice plunges you into the depths of a raw, unfiltered mind that is slowly consumed by darkness. As you sit still, enthralled by every moment of this horrific masterpiece, the monsters propel you into the most thrilling fight for your sanity, and survival. 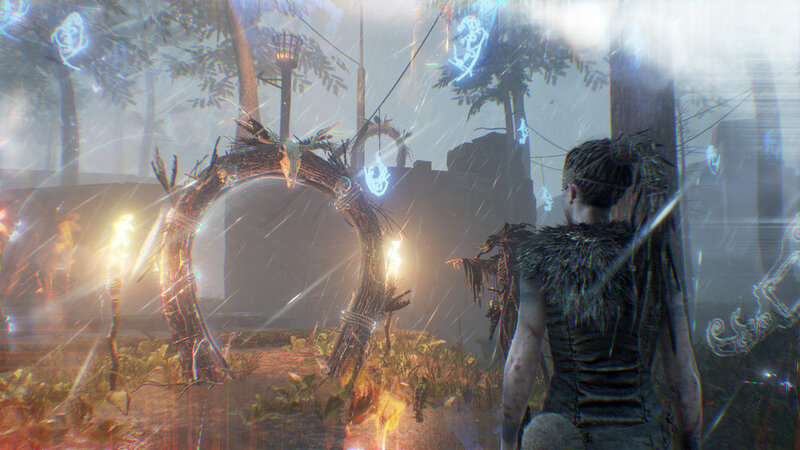 In this action-adventure puzzle game, the player is presented as an observer of Senua, a Celtic warrior in the Viking period suffering from psychosis. Senua must make her way to Helheim in order to save her dead lover’s soul, all the while battling terrifying enemies, solving intricate puzzles, and resisting the voices inside her head. Senua’s journey captivates with its two primary gameplay sections, combat and puzzles. With no tutorial or HUD, the player must use their instincts to survive the darkness, leading to unpredictable and suspenseful encounters. Senua can melee and perform light or heavy attacks with her sword. She also has the ability to block, parry, and lunge. All of her actions stylishly combo together for a devastating amount of damage. Additionally, when she activates her Focus—a built-up ability—she slows down time, regains health, and reveals enemies that are protected by darkness. The combat is ruthless and intense, especially on the hardest difficulty, as Senua is only allowed to take three or so hits before death. Upon your first failure, which is scripted in a grim cutscene depicting Senua’s death, the game explains that every time you die, rot will grow up Senua’s arm. If the rot reaches her head, she dies and you lose all progress. The presentation of the gameplay is simply ingenious, forcing the player to find their own way in terms of combat without abandoning them completely. The voices inside Senua’s head aren’t scripted. They’re actively aware of her actions and surroundings. When you're in the midst of combat, a creepy faint whisper will surface, “there’s someone behind you,” causing you to jolt out of the way of a monstrous axe. Another example of this occurred during one of the most cinematic moments I experienced, the battle with Surtr the Fire Giant. As I was on the ground, battered and bloodied due to Surtr’s impenetrable defense, the voices repeated the same word over and over again, “Focus.” This was the first time the Focus mechanic was introduced, so naturally I ignored it, thinking it was just the voices messing with my head. I quickly realized that the voices were actually guiding me. When I finally pressed Focus, Senua leapt off the ground and sprinted toward Surtr, breaking his defense with a heavy lunge attack through his chest. Ninja Theory perfectly utilizes the theme of psychosis to guide the player throughout the game. However, the voices don’t always help, and simply exist to enhance Senua’s misery through insults, creepy laughter, and misinformation about where she's going. Therefore, you’re wary of misplaced trust, which is exactly what the developers want. Hellblade’s bosses and enemies are intimidating and terrifying. Enemies wield large swords, axes, and shields, while the mini-bosses swing even bigger axes. The game pits the player against bosses like a giant invisible wolf and a nimble illusionist that flings swords. The game continuously raises the stakes with the number of enemies and length of the scenarios. When an opponent attacks, you quickly dodge and maneuver around them until you can recognize their moveset and find an opening. Being cautious is key, as a misstep can cost you your life. The most intense fight I experienced was during the Sea of Corpses section. Knee deep in blood, countless enemies attacked for what felt like unending 360 degree combat. It felt empowering, as if Senua was tearing away at the internal darkness inch by inch while she made her way to the exit. Another scenario forces players to use a torch to stay out of the dark, since entering the shadows turns Senua into Fenrir’s dinner. Enemies eventually appeared and I was forced to throw the torch. The torch flickered in the corner of the room, limiting my range of movement while fighting multiple enemies. This scenario added yet another layer of intensity and fear that I thought Hellblade had tapped out of. Hellblade isn’t all about Senua fighting her way through the darkness. She must find the way first. During the first half of the game there are small puzzle sections like matching symbols to doors in order to progress. These can be tedious, but begin to pick up pace during the illusory section. The illusory section is incredibly entertaining because you have to look through portals and notice changes in the environment to proceed. This is another great way Ninja Theory utilizes the theme of psychosis. Puzzle solving slowly develops into a riveting nightmare in the Trial section. Hellblade induces horror during the Swamp and Blindness challenges by taking away your weapon and unleashing terrifying enemies to chase you. These are the most dangerous sections of the game, as it throws you into an unpredictable scenario with no weapon, thus taking the control out of your hands. While being chased through the Swamp section, I had to find three symbols to escape a wooden labyrinth. Fearing certain death, I didn't look at the creature, but my heart still pounded at every noise, shadow, and wrong turn. It was genuinely horrifying. Hellblade: Senua’s Sacrifice tests the player’s strength, courage, and wits throughout its gameplay for an intense, fulfilling experience. Hellblade presents a magnificent adventure that leaves a crater in your soul. Senua makes it her mission to save Dillion’s soul while in a constant battle for her sanity, but what does that actually mean? Is her battle with Norse mythological gods really happening? Or is it all in her head, a metaphor for fighting her condition and a way to overcome her loss of Dillion? Ninja Theory doesn’t spoil us with the details, and that was the best decision. Whatever it may be, it doesn’t affect Senua’s courage and resilience to fight past her psychosis. What matters is Senua’s cause for taking the journey. The way the game slowly reveals her backstory through the accomplishment of each challenge is truly brilliant and gives players deep incentive to continue. Every bit of information strengthens your relationship with Senua, further investing you in the emotional narrative. Hearing about her troubled childhood or how she lost Dillion can absolutely wreck you. While many of us may never experience psychosis, Ninja Theory’s presentation makes it easily relatable. Hellblade doesn’t shorthand you on lore, either. Collectibles throughout the game tell compelling Norse mythological narratives, with every section featuring a different theme. The most memorable one was when the narrator discussed Ragnarok, the end of the world. The story drew obvious comparisons to how the game was also coming to an end, and the threat to Senua’s life. The narrative is meant to keep you on edge, wondering whether Senua will be consumed by her condition like the wolf consuming the sun in Ragnarok. 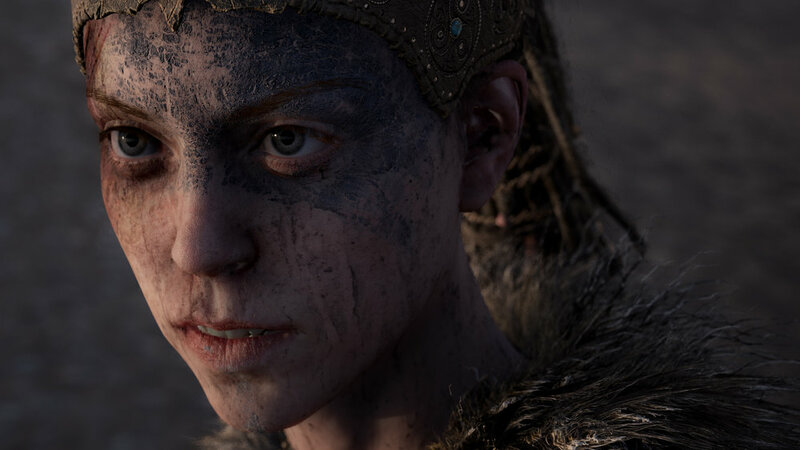 Hellblade’s visuals, sound design, and Melina Juergens’ performance are what drive the experience. 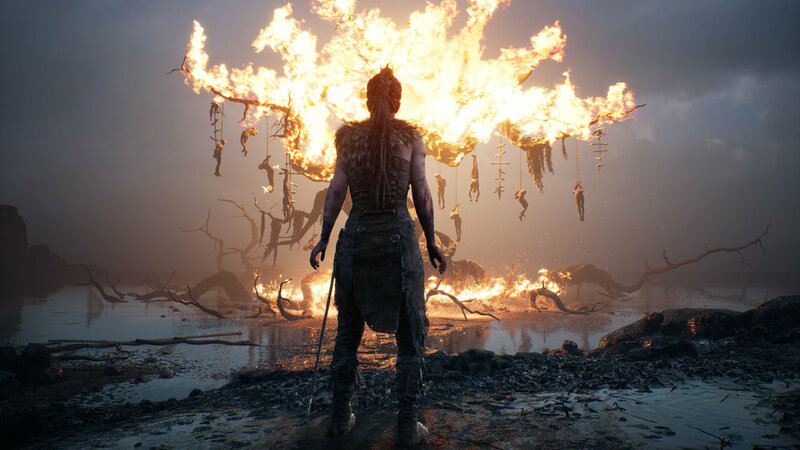 When the game opens, you’re introduced to a beautifully grim riverbed where Senua starts her journey. Voices slowly encapsulate you. The bilateral sounds coming from your headphones reverberate through your bones as the game’s creepiness quickly sets in. It's incredibly uncomfortable at first, as if someone is calling out to you in the real world. Then, when the psychedelic music fades in, you feel like you’re diving straight into nightmare fuel. Ninja Theory perfects a heart pounding experience, and Melina Juergens tops it all off. 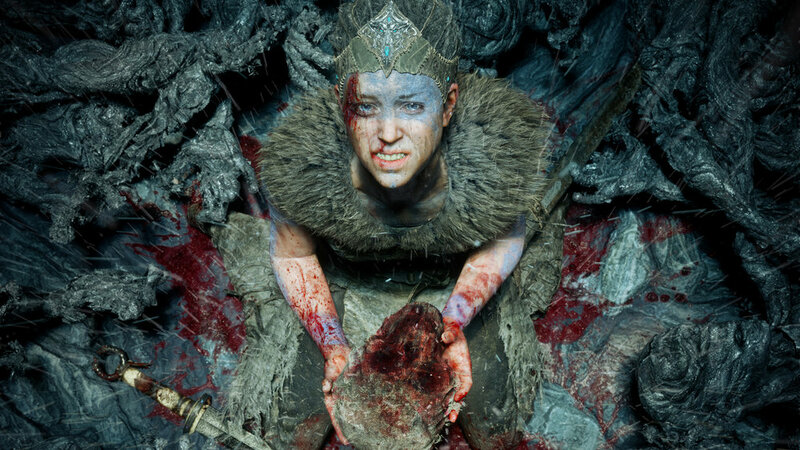 Senua is initially cautious at every battle due to her fear of failure. However, she fights herself to carry on and push back the darkness. As you feel every ounce of emotion in her face, you sprint forward on the assault. You feel her pain, loss, and sorrow. It’s all in Senua’s eyes, not exposition. The fact that Andy Serkis presented The Game Awards’ Best Performance to Melina Juergens is simply poetic. It’s a testament to the quality of her acting, and a glimpse at her future in the business. Every combat scenario is breathtakingly cinematic thanks to the lack of a HUD. One of the more memorable moments is when Senua swiftly unsheathed her sword as enemies appeared on the complete opposite side of a bridge. As I sprinted forward, epic war drums and vocals pounded through my ears. After I eliminated my foes, the music subsided. Crisp clouds hovered over me and the path was open. 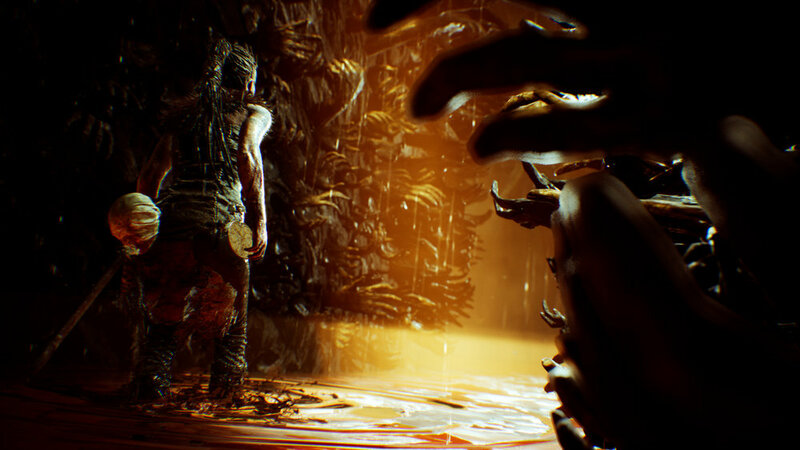 Hellblade also includes a Photo Mode to capture screenshots. It incorprates filters and several options such as removing Senua’s character model from the shot. Photo Mode doesn’t add anything to the gameplay, but is a neat feature for those interested in capturing the game’s beauty. One of the most interesting aspects of Hellblade’s visuals and execution is that no human other than Senua is modeled in the game. Senua’s father, mother, and Dillion are all presented through live-action performances. While this is jarring, it effectively represents reality in Senua’s memories. It’s possible that it could even be the defining line between reality and the world as Senua sees it, which is fascinating to contemplate. Despite a few bugs causing skipped movements and repeated audio clips, it’s hard to label Hellblade as anything short of a masterpiece. The lengths that Ninja Theory went to create an accurate representation of psychosis and the way they continue to effectively reinforce that theme is admirable. Hellblade delivers an engaging combat system spearheaded by compelling acting and visuals, not to mention the eerie sound design that will turn you into a puddle in a corner. Hellblade: Senua’s Sacrifice is an absolute steal, especially for $29.99, and an adventure that everyone, even non-gamers, should undertake.